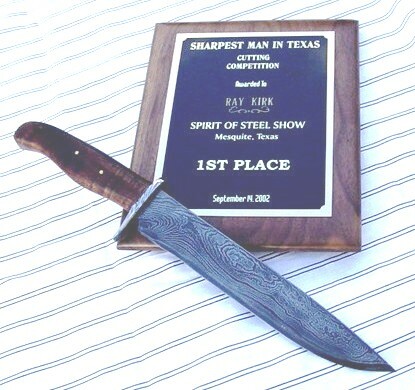 This was my 5" competition blade that was used to win the hunting knife cutting contest in the spring of 2001 at Washington. A handle of scorched Bois D' Arc wood on a forged blade of 52100 that was differentially heat treated. A slight etch shows the temper line. My wife's neck knife of ladder pattern damascus with ivory handle and scrimshaw by Charles Conner. A pearl and damascus dagger. A 7" fighter of 52100 and snakewood. The skinner has a 3 3/4" long blade that is.127" at the ricasso. It has a tapered tang and a full distal taper on the blade. The mammoth ivory scales are attached with 3 nickel silver pins. The knife is 7 3/4" in over all length. 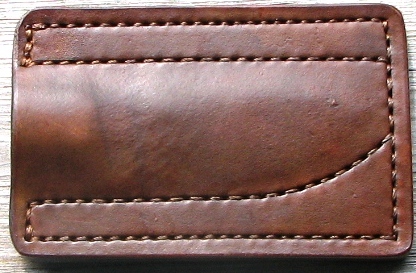 Premium leather pouch sheath by Mike Stott. This knife is forged from 52100 and has a twisted damascus S guard. The hidden tang is covered with premium grade curly maple and is attached with K&G epoxy and nickel silver pins. The lanyard is parachute cord from my son in the Marines. The overall length is 14 3/4". The blade is almost 2 inches wide and a length of 9 7/8". The flat ground blade is 1/4" thick at the ricasso and has a distal taper with a clip point that is slightly background. The knife weighs about 16 ounces and has been differentially heat treated. The Medicine Blade is an integral style knife that was forged by Ray Kirk of Tahlequah, Oklahoma, a Master Smith in the American Bladesmith Society and a Citizen of the Cherokee Nation of Oklahoma. Each blade has been forged from a round bar of 52100, a high carbon steel of extreme high quality, and then **smoked**. The handle material on this hidden tang knife is a solid piece of burl that has been stabilized by one of the best stabilizers in the business, K&G of Lakeside, Arizona. The specially made high quality leather sheath was made by Mike Stott of Tahlequah, Oklahoma. The sheath has been specially designed to safely contain the blade until it is ready to use. The length of the differentially heat treated blade with a distal taper is 3 7/8 inches and the overall length is 8 5/8 inches. Blade lengths will probably vary an 1/8" due to each one being forged by hand. Each knife is marked on the blade with the stencil “RakeR” with the “MS” directly below. The other side will have the stencil of “MEDICINE BLADE” and Ray’s Cherokee Register Number, “COO41719", below it. Every effort has been made to insure that each blade will provide excellence in both performance and behavior. Scagel Style Folder pattern that was bought from the ABS that was donated by Jerry Van Eizenga of Nunica, Mi., an excellent teacher of the folder. These blades are made from 52100, a high carbon ball bearing steel, and 4352, a medium carbon steel with 1.7% nickel to retard stress cracking and is used as a military track pin steel. 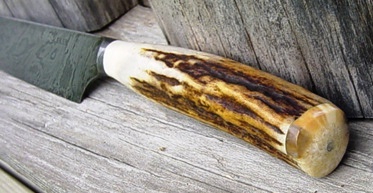 Handle material may vary from stabilized wood, stag, bone or ivory. The liners are titanium and the scales are attached with three 2-56 screws. This allows for adjusting the hinge pin and keeps from cracking the handle material. The price of the standard model with micarta or wood scales is $255.00. Other handle and blade material will determine final cost. The standard folders come with stabilized burl scales and titanium liners and. The scales are attached with screws to eliminate stress cracking of the handle material from peening. The spring is made from 4352, a medium carbon, high nickel steel which also is designed to reduce stress cracking from bending. Over all length is 3 3/8" and blade of 2 1/8"
Price as shown: $170.00 which includes shipping. The Pocket Medicine blade is a small fixed blade that has been forged from a 1 3/4" round bar of 52100. This is the smallest of the Cherokee Heritage Series knives. The standard handle material is stabilized maple burl or stabilized California buckeye burl. The 3" blade on this tapered tang knife has been differentially heat treated and is about 6 1/4" in overall length. The knife weighs about 2.4 ounces and comes with a billfold size pocket sheath made by Mike Stott of Tahlequah, Oklahoma. Also included is a certificate stating the materials and other information about the knife.